The Colorado Thunderbirds made state hockey history over the weekend of Nov. 6-8 at the Bauer World Hockey Invitational in Chicago. 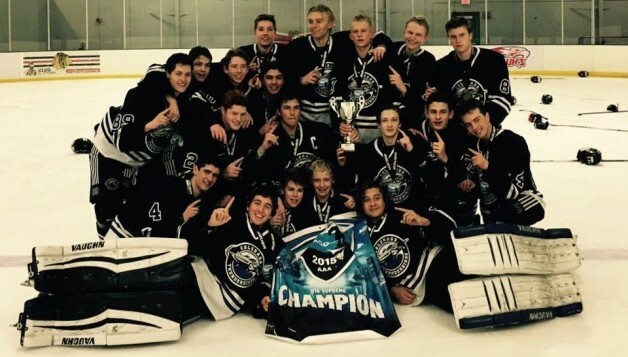 The T-Birds’ 16U AAA National team captured the top division – 16U Supreme – to become the first program from Colorado to win a AAA championship at the 430-team event, which is the largest ice hockey tournament held in one city. The Thunderbirds defeated Detroit powerhouse Little Caesars, 5-2, in the championship game, their seventh game in 52 hours. The tournament awarded co-MVP honors to defenseman and captain Colby Bukes and goaltender Jonah Giem. Bukes led a balanced T-Birds attack with seven points, while Giem allowed just two goals on 65 shots for a .969 save percentage. As a team, the Thunderbirds allowed just five goals in seven games, and their total of 89 shots against in seven games means they limited foes to fewer than 13 shots per game, a testament to the club’s strong defensive play from all positions. The T-Birds went 2-0-1 in round-robin play, defeated Afton (Mo. ), 6-0, and the Minnesota Magicians, 5-2, while tying the Chicago Young Americans, 0-0. The round of 16 saw the T-Birds beat the defending champion Yale Lions Prep (Abbottsford, B.C. ), 6-0. Next up in the quarterfinals was the North Jersey Avalanche, the only team to defeat the Thunderbirds (27-1-1) this season, winning 4-3 in a shootout on Oct. 11. The Thunderbirds regrouped in Chicago with a 2-0 victory. The semifinals brought another sizeable challenge – literally and figuratively – in Omaha HC, a team that took the T-Birds to overtime. Omaha scored with six minutes to play but the Thunderbirds responded three minutes later to tie it on a goal by Cole Quisenberry, “a dirty, hard-working goal,” Ricci said. Defenseman Will Brown struck with less than a minute to play in overtime to send the T-Birds to the title game. In the final, the Thunderbirds played another big, strong, talented team in Little Caesars, but played a very disciplined game and won, 5-2. “Our staff was so pleased with how our team responded to making adjustments,” noted Ricci. Forwards Jake Gricius (three goals, three assists) and Quinn Martin (four goals, two assists) added six points apiece and defenseman Nikolai Lyssogor (one-four) chipped in five. Five other T-Birds AAA teams also reached the playoffs, highlighted by the 12U team going 5-1 in the 2003 Elite division, outscoring foes 25-17, and reaching the semifinals. The 16U American squad went 2-2 in the Nexus division and fell in the round of 16. The 14U team went 2-1-1 in the 2001 Supreme division, losing in the round of 16. The Bantams had a 12-4 goal differential. The 13U team finished 3-2 in the 2002 Elite division with a 15-9 goal differential, but lost in the quarterfinals. The 11U team went 2-2-1 in the 2004 Elite division and also reached quarterfinals.